What book in this field has inspired you the most? Did your research take you to any unexpected places? Vienna, New Delhi, Aqaba, Cape Town, Zululand. What did you enjoy the most about writing your book? Finding unexpected personal as well as cultural linkages among the protagonists. What did you find hardest about writing your book? Making musical composition and architecture accessible for readers with no special training. Is this your first published book, or have you had others published? 7 sole-authored, 1 co-authored, 3 edited. Chapters in 45 other books. How did you feel when you saw your first published book? Why did you choose to publish with MUP? Being part of the Studies in Imperialism series. Did you approach writing this book differently to any of your previous work? Each of the linked-essays that comprise the book required as much research as a full-blown monograph. Most needed input and comment from outside experts. Thus the book was many years in the making, written in between other projects and deadlines. Have you had time to think about your next research project yet? What are you working on now? One project is a reflective book on the trajectory of heritage politics & policies in Australia. Another is a continuation of my history of southern Africa where I left off in 1854 in my book Great Treks. 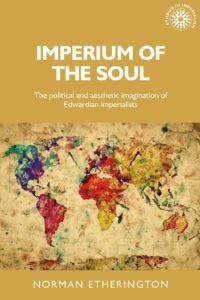 Imperium of the soul is available now! Category: Blog, History	0 Comments.